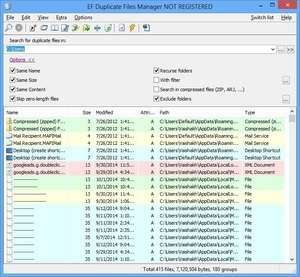 EF Duplicate Files Manager is a quick and easy application specifically for finding and then sorting duplicate files found on your hard drive with the task of cleaning up your hard drive. It can handle virtually any type of file it finds on your hard drives and can also find duplicate files found in various types of archives such as 7-ZIP, WinZip files and those also found within WinRAR RAR archives. Removing duplicate files from your hard drive, especially when they are large movie and audio files, can speed up your computer and allow you to use more space. For security reasons, you should also check out the Duplicate Files Manager download at LO4D.com which includes virus and malware tests. Additional screenshots of this application download may be available, too.